About £500,000 will be spent adding speaker facilities to existing cameras. Shadow home affairs minister James Brokenshire said the government should be "very careful" over the cameras. "But the vast majority of people find that their life is more upset by people who make their life a misery in the inner cities because they can't go out and feel safe and secure in a healthy, clean environment because of a minority of people," he added. The talking cameras did not constitute "secret surveillance", he said. "It's very public, it's interactive." Competitions would also be held at schools in many of the areas for children to become the voice of the cameras, Mr Reid said. Downing Street's "respect tsar", Louise Casey, said the cameras "nipped problems in the bud" and reduced bureaucracy. "It gets across the message, 'please don't litter our streets because someone else will have to pay to pick up that litter again'," she told BBC News. "Half a billion pounds a year is spent picking up litter." Mr Brokenshire told the BBC he had a number of concerns about the use of the talking cameras. "Whether this is moving down a track of almost 'scarecrow' policing rather than real policing - actually insuring that we have more bobbies on the beat - I think that's what we really want to see, albeit that an initiative like this may be an effective tool in certain circumstances. "We need to be very careful about applying this more generally." 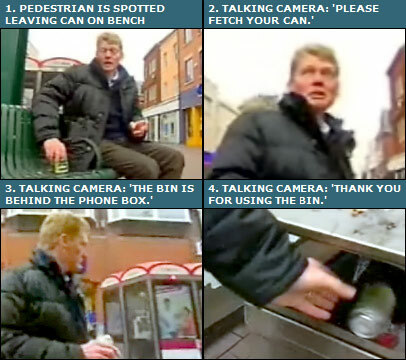 The talking cameras will be installed in Southwark, Barking and Dagenham, in London, Reading, Harlow, Norwich, Ipswich, Plymouth, Gloucester, Derby, Northampton, Mansfield, Nottingham, Coventry, Sandwell, Wirral, Blackpool, Salford, South Tyneside and Darlington. In Middlesbrough, staff in a control centre monitor pictures from 12 talking cameras and can communicate directly with people on the street. Local councillor Barry Coppinger says the scheme has prevented fights and criminal damage and cut litter levels. "Generally, I think it has raised awareness that the town centre is a safe place to visit and also that we are keeping an eye open to make sure it is safe," he said. But opponent and campaigner Steve Hills said: "Apart from being absurd, I think it's rather sad that we should have faceless cameras barking at us on orders from who? Who sets these cameras up?" 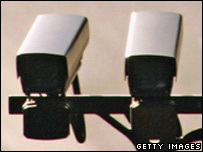 There are an estimated 4.2 million CCTV cameras in Britain. A recent study by the government's privacy watchdog, the Information Commissioner, warned that Britain was becoming a "surveillance society".